Max Yasgur's 600 acre dairy farm in Bethel New York was the site of the Woodstock Music and Art Fair held on Aug. 15-18, 1969. Without Max, Woodstock may have never taken place. A children's picture book titled Max Said Yes! The Woodstock Story tells about this legendary moment in history, the weekend when peace, music and love pervaded the Yasgur farm. Who better to write a Woodstock story than a relative of the farmer that shared his land? 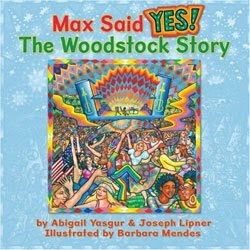 Abigail Yasgur, a second cousin of Max Yasgur, was only 14 when Woodstock took place. She did not attend the festival but it has obviously impacted her life in big ways, and she's been asked many times about her relation to Max. She and her husband Joseph Lipner even named their own son after Max. Their book is about the values that define the Woodstock generation: peace and love and the idea of acceptance and kindness toward others. The hippies and long-haired men, the rain, the mud, the hot sun, the long lines of traffic and large crowds, the stage where famous musicians played - the authors write about all those iconic images using rhyming text and show how Max welcomed the world to his dairy farm. The rainbow hued illustrations by Barbara Mendes full of smiling, joyful concert-goers, rolling pastures and dairy cows, further romanticize the Woodstock experience. I cannot even fathom what Woodstock must have been like to see in person. The thought of over 400,000 all congregated on one rural farm is beyond my comprehension. The festival took place before I was born. My preschool daughter can't really understand the magnitude of it either. Max Said YES! provides a gentle, sterilized introduction to this period in rock and roll history for young children. Phrases such as "Not long ago, when mom and dad were young" and "Ask mom and dad, who won't forget" make the book a little confusing to read, because many of the parents that will read the book to their children (like me) probably weren't even born yet at the time of Woodstock. Despite this minor oversight, those that witnessed Woodstock and are now grandparents, those parents that wish they'd been old enough to see the festival--that's the audience that will enjoy reading and sharing this book. "I'm a farmer...I don't know how to speak to twenty people at a time, let alone a crowd like this. But I think you people have proven something to the world...a half a million young people can get together and have three days of fun and music and have nothing but fun and music, and God bless you for it." Oh, you young whipper snappers! This old blogger could have been there as it was my senior year in college and oh how I wish I had gone! ...and yes, I wore bell bottoms and flowers in my hair...and yet went on to teach children for these past 37 years..hopefully giving them a sense of what peace and love can be about at times! Sounds like a great book and so interesting with all the info and press on this 40th anniversary! Thanks for a great review!